We dreamed up this post lounging around on Northside grass, peeled grapes being handed to us by the Irish Times sports staff, having conned them into thinking we might need them to ghost an autobiography at some indistinct point in the future. But we soon realized the subject matter was far too serious for us, and we needed to rope in stats guru Andy McGeady for a joint post. You’ll be able to tell who is responsible for what – the critical insight, relevant statistics and funny bits are from Andy, and the bitterness, carping and anti-Munster bias from us. The issue of player welfare is something that will be big for us this year. Careers are getting shorter (Ian McKinley, Eoin O’Malley), the level of concern for serious injury differs among observers, and those players who are lucky enough to forge long and successful careers are increasingly paying for it with huge playing time. On this year’s Lions tour, Warren Gatland said that the physicality of rugby had gone up a notch since the last tour. It was a statement that left us reeling; the 2009 series in South Africa was so bruising you almost felt your ribcage tightening just watching it. The stakes are increasing all the time. And when the NFL, where owners readily acknowledge players are mere commodities, seems more concerned about managing careers than rugby, we got a problem. Two cases in point: Mike Ross and Ruan Pienaar. Forget Johnny Sexton, Ireland’s most important player is nerdy Corkman Ross because if you don’t have a competent tighthead prop, you’re goosed. The opposition will milk you for penalties, and if you get away with giving up 12 points from this source, you’ve done well. Consider the last time Ireland had to do without an effective tighthead for a big game – in Twickenham in 2012 when Tom Court was forced to deputize for the crocked Ross. Shudders. This isn’t a Court diatribe of course, he is a loosehead by trade and was pressed into service through necessity, but merely illustrates the point. Not only are tighthead props the most important players on the pitch, they are also typically the biggest (BBC infographics seem to delight in broadcasting the weight of Ireland’s tighthead) and strongest. The power output has increased to the extent that in the Southern Hemipshere and France, a prop isn’t expected to last longer than 60 minutes, with a new front row often introduced en masse between 50 and 55 minutes. In Ireland, however, we are milking Mike Ross to a terrifically dunderheaded extent. Ross has played every game of note in the last three years for Leinster, and, once he saw off the ‘spirited challenge’ of Mushy, every game possible for Ireland in two and a half. And this is literally every game possible. When Ireland played a disinterested (for multiple reasons: the IRFU didn’t give them the respect of playing a full test, and they had just buried a team-mate) Fiji in November, Ross was required to tog out to prove his fitness. Then in June, when we toured North America, it was decreed we needed Ross to see off Shawn Pittman (London Welsh) and Hubert Buydens (Prairie Wolf Pack). Why? By the end of last season, Ross looked completely shattered, markedly less effective and in need for a long rest more than anything. Was it really necessary to fly him around the world to steady the scrum? Frankly, without Ross, Ireland would struggle to win a game in the Six Nations, never mind against a Southern Hemisphere giant. Ruan Pienaar, in turn, is Ulster’s marquee man and their key playmaker. He joined the brethren from the Sharks after the Tri-Nations of 2010, and has not only played every game of note Ulster have had (in both the HEC and the Magners/Pro12), he’s been involved in every Springbok squad in that time – encompassing a World Cup, two Rugby Championships, a Tri-Nations, three November tours and three June tours. Not much time for day trips to Bangor, that’s for sure. Maybe it’s us, or maybe it’s the more rarified level Ulster are operating at now, but Pienaar seems notably less effervescent than he was two years ago – at the tail end of last year, he looked mentally jaded and unimaginative. Paddy Jackson and the speedsters outside sometimes rarely saw the ball, aside from chasing box-kicks and fielding delayed passes. For Ulster to take the next step in their development, which is often the hardest one, and win some silverware, they’ll need their best players fully engaged and in top form. When the gentlemen of Whiff of Cordite brought up the subjects of Mike Ross and Ruan Pienaar I did what I am wont to do – I took out the pad and paper, scratched a few things down and had a good, solid mull. Then I fired up the stats machine. Mike Ross, as Leinster and Ireland’s number one tight head prop forward, is a singularly important player in Irish rugby. And, yes, last season he indeed played a very large number of minutes compared to his contemporaries in European top level rugby. Note: the stats used are from the 2012/13 season proper, i.e. the same information that would have been to hand before people flew off to various summer tours. Of all Rabodirect Pro 12, Aviva Premiership and Orange Top 14 props only six men played more minutes of domestic, European (Heineken/Amlin Cup) and international rugby than the ex-Harlequins man managed during the 2012/13 season. Mike Ross is thirty three-years old. 1867 minutes of rugby at an average of 64 minutes per outing is a decent shift for a top level front row, especially so at that age. But he is also thirty-three years young. Mike Ross might have a birth certificate bearing the year 1979, but between professional club and test level rugby he doesn’t have as many rugby miles on the clock as others. Fellow thirty-three year old Carl Hayman, for example, played the last of his 45 tests for New Zealand in 2007. Ross first pulled on an Irish test jersey in 2009 playing two summer tests against Canada and the USA, not featuring again in a test side until playing Italy in Rome in 2011. Since then, of course, Ross has been a regular for Ireland but with just five weeks in age between himself and Hayman the contrast between the two couldn’t be more stark. And it wasn’t just in the international arena where Ross was a late starter; it took the former UCC and Cork Con man some time to nail down a regular first team slot with a top side, becoming a regular with Harlequins in the 2006-07 season. Depending on how you look at it Ross has made between one and two fewer season’s worth of top level club appearances than the other capped thirty-and-overs in that list, Tom Court excepted. That’s something to think about. It’s a Matt-Stevens-worth of games, after all. Ruan Pienaar, like Ross, was the most flogged horse at his position in his league over the 2012/13 season, sitting in third place on the most-minutes-played list of halves currently plying their trade in the European game. Jonny Wilkinson and Rory Kockott might have both played more raw minutes than the South African but neither had to cope with the more rigorous physical and mental demands of the international game (not to mention travel to, literally, all four corners of the globe). The fourth placed Ian Madigan, just behind Pienaar on the list, had just 62 minutes of international rugby in that time (Ronan O’Gara had 78, for those scoring at home). The IRFU will have no real say in how often Pienaar plays for Ulster, or at what position, perhaps with the exception of suggesting quietly that Paddy Jackson might be offered some time over the kicking tee in live games. Joe Schmidt and the Irish coaching staff will, however, have some control over the number of minutes that Mike Ross spends rambling around paddocks in the blue of Leinster or green of Ireland. But whether his odometer or registration plate is the more accurate gauge, perhaps only the man himself will know. Thanks to Andy McGeady for his contribution. Visit his own excellent site here. In 2010 he played in the June Internationals, 3 nations and Autumn Internationals. In 2011 he played in the 3 nations and RWC. In 2012 he played in the June Internationals, 4 nations and Autumn Internationals. It doesn’t look as if the guy has had a proper pre-season in the last 4 years. From an Irish perspective I think we are starting to look OK in the tight-head department, Hagan getting some game time in the Premiership, Archer starting to mature and hopefully being passed the baton to a greater extent this year by Botha. Also, the emergence of Lutton as an option in Ulster and the upcoming naturalisation of Nathan White in Connacht and the continuing development of Loughney. I don’t think picture looks as rosy for Leinster and Ross as, just Hagan left just when he was becoming a real option, and Bent really disappeared in the second half of last season after getting humiliated a couple of times at scrum time. I don’t disagree with the principle of this piece at all its a very compelling argument. However there are – hopefully – a whole set of data about players that we are not privy to from the gym and lab. I would hope that Ireland/Leinster have a series of physical power output tests of some sort to keep an eye on their props ability to generate force in the scrum. However I haven’t a clue if they do or not, or whether they are very basic (squat numbers) or high tech scrum machine stuff. Anyone have any idea about whether this is the case or not? Welcome back after the short break lads. I’ve said it before but hopefully from a Leinster and Ireland (although less important for Ireland) perspective Bent ends up being the next Stan Wright I.e. shockingly bad first season followed by grinding out solid performances that make him a Leinster first choice. I recall Tagdh (sp?) Furlong played a blinder in the 2011 or 2012 JWC. He looked a real propect for Leinster but had a bit of an injury ridden season last year. I’d expect him or Moore to step up a bit this year. Justin Fitzpatrick must be the #2 tighthead and played very well in the June series in NZ last year, as did Hagan. If Fitzpatrick can have an injury free season, himself and Ross will be solid for Ireland. The new props coming behind I suspect will need another season at provincial level in the Rabo and Heineken leagues and the Wolfhounds to develop and provide Ireland some depth. Moore and Furlong are very highly rated (the reason Hagan was allowed to leave) and this year’s pack destroyed Australia and New Zealand in the JWC. Mr Poite might have binned the NZ front row! 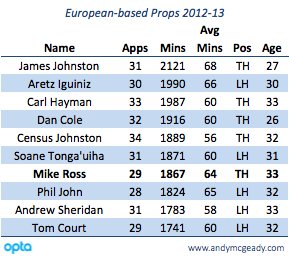 Just one problem, with rare exception (C Healy) it takes at least 5 years to turn talent into performance at Prop. So looking great for the 2015 – 2019 cycle! Interesting article. I don’t necessarily agree with the general thesis though. Is Mike Ross really being over-played? I’m not sure. He is a professional prop with all the training and back-up staff that goes with that. 29 games in a season is a very reasonable request if you ask me and I genuinely believe that the average minutes on the pitch is some-what irrelevant. The worrying thing for me isn’t that he is playing so much but that there is nobody challenging for his position, because let’s face it while he does an OK job in the scrum he is not in any way effective in the loose, barring the rare defensive intervention. The new scrum laws have changed to make the scrums more consistent and by default less arduous for props. This should have the knock-on effect that props will now actually be required to play some rugby around the pitch (an idea that seems to have been lost in all corners of the world barring NZ). My propping tips for the future are Peter Dooley in Leinster and John Ryan in Munster, two young props with genuine ability to catch and pass a rugby ball! While the loss of a truly competitive scrum is lamentable, I think this will be a step in the right direction. Apparently the laws have now tightened regarding the straight feed and will hopefully revert to an actual contest between the hookers. Someday I hope to see a 1,3,4&5 lining out for Ireland who, while not necessarily throwing skip passes and running tries in from 40m, we can rely on to not cack their pants if the ball comes anywhere near them and they could potentially ship it onto someone in a better position. Healy is good in the loose, but the rest of the current prop/row pack have a long way to go! Anyway that’s my tuppence on Mike Ross and the pack. As for Pienaar I am not sure – I agree that potentially the excessive travelling may be exhaustive but again I don’t think too much rugby is the problem. These guys are professionals who live and breathe the sport and want to play as much as possible, and so it should be. His creative slump? Players go through peaks and troughs in their careers-it just happens. Drico, Carlos Spencer, Matt Giteau…..it’s often a psychological thing and I don’t think too much rugby has a massive bearing. Picking up on Owen Frank’s (Go on the front row union!) point, I do wonder if the long term impact of the new scrum laws will be to make the tighthead less important. I recall Cian Healy tweeting something around the time they were announced about how it meant teams would start to play an extra two flankers. Obviously that’s something of an exaggeration but the fact is that without the hit being as big as it previously, there will be noticeably less pressure put on the tighthead. 2. The drive (which requires technique and strength to attack/defend against your opposite number). By my logic, if you take one of those things (the hit) out, the technical skills and strength required becomes far more specific (to focus primarily on the drive alone), which will mean potentially a (slightly) different body shape would excel. I would love to be corrected on that, but IF I were correct, perhaps this fear surrounding our reliance on Mike Ross becomes less of an issue, and we should really be developing tightheads who are more suitable to the new scrummaging game. Mike Ross is not the only guy on that list of tightheads playing a lot who noticeably dipped at the end of the season. James Johnston did not finish it well, while Dan Cole was noticeably less than he can be on the Lions tour. To me, it is common sense that rugby players need rests. No matter how willing the mind, the flesh can not always comply. I’m not talking about major injuries here, I’m talking about the minor niggles and stiff muscles and little tears that won’t go away if you keep aggravating them. That sort of physical wear and tear will detract from top performance. Personally, I hope that Ulster take a gamble and send Pienaar on a long holiday for part of the season, as having him available at his best is huge for Ulster. The scariest thing in that whole article is Dan Cole’s age. You know the way they say you know you’ve getting older when cops start looking young? It should be updated to – you know you’re getting old when grizzled props are actually younger than you.